Behringer X32 Rack Review: Why Do People Love the X32 Digital Mixer? Who Should Consider Using the Behringer X32? Conclusion: Is the Behringer X32 Right for Your Church? Midas M32R Review: Can the M32R Support Your Church Worship Team? Behringer is one of the most trusted names in the audio mixer business. With the X32 rack, they offer a rack-mountable digital mixer with a variety of features that both professionals and amateurs can enjoy. For those looking for a new mixer, the Behringer X32 deserves a closer look. What is the Behringer X32? The Behringer X32 is a rack-mountable digital mixer with 40 input channels. It is designed to fit a standard 19-inch audio rack and intended for both live and studio recording. The X32 was first released in 2013. Since the initial release, this mixer has received several firmware and software updates to help improve the functionality and versatility of the mixer. With the latest updates, Behringer added an Auto Mix feature, which allows Dugan-style gain sharing for more gain from the main speakers. The X32-Edit app for smartphones and tablets has also been updated numerous times and now includes a new interface with configurable fader layers. The Behringer X32 rack-mountable digital mixer is primarily intended for live mixing and recording. However, it does provide the features that you need in a quality mixer for studio recording. While this is a digital audio mixer with a lot of bells and whistles, it does not have a steep learning curve. Amateurs will get just as much use out of this mixer as the professionals will. The Behringer X32 is also available at a reasonable price, right around the $1000 mark, depending on the current sale price. This price point may make it out the reach of hobbyists. However, it offers a sound quality that rivals more expensive options. When you unpack the box, you will find a 19” x 11” x 5” rack-mountable mixer, instruction manual, and a 32-channel USB recording card. The rack does not come with any cabling or wires. You simply get the mixer and a USB card for those who want to edit through digital audio workstations (DAW) on their computers. The X32 is built for standard 19-inch racks. It is housed in a three-rack-space chassis, making it compact and portable. It is easy to transport from gigs or set up in the studio. However, there are many more features hidden inside this device. The X32 includes a standard 168 x 168 digital routing matrix, delivering sound to the digital signal processing (DSP) core. There are 40 input channels including 32 microphone channels, six auxiliary inputs, and a separate stereo USB input. The X32 also features 16 Midas-designed microphone preamps that provide exceptional sound. The auxiliary inputs do not include conventional digital inputs, such as an S/PDIF input port for directly connecting devices that use S/PDIF outputs. The USB input also lacks functionality as it does not recognize MP3 files or connected iPhones or iPods. It only plays back WAV files stored in folders. The interface of the X32 is limited to provide a simple control scheme. Most of the features are accessible through a connection with a DAW or the mobile app. However, there is a small high-resolution display on the front panel. You also get a virtual FX rack with eight stereo slots for simulating digital effects systems, such as the Lexicon 480L. Other digital features include the 32 x 32 channel USB 2.0 audio interface. The X32 is also expandable. You can easily integrate additional gear including audio interface cards, digital networking bridges, and mixers. It also features dual AES50 ports, which allow you to connect to three S116 digital snakes from each of the ports using CAT 5 cabling. Along with these features, Behringer continues to update the firmware and software. They have released three major versions of the firmware and several minor updates to both the firmware and the mobile app. They keep adding useful features, including the option of setting up a full crossover and reverse polarity on the outputs. While the Behringer X32 is a quality mixer, it does have a few limitations. However, these limitations are related to the construction of the mixer and not the features that it provides. The X32 includes a lot of plastic parts and a frame that may not hold up to the rigors of touring. It is also susceptible to overheating. If you are looking for a mixer for touring and expect to get a lot of use out the mixer in a variety of live settings, this may not be the most durable option. 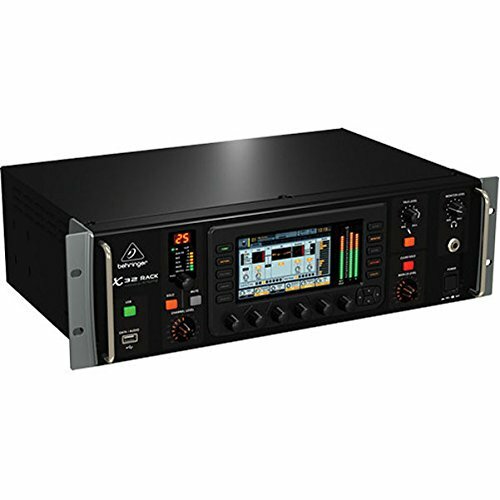 An alternative option is the Allen & Heath QU-16C rack-mountable compact digital mixer. It has a metal frame for added durability along with a microphone cable, label kit, and 10 feet of instrument cable. However, it features 16 analog inputs compared to the 32 included on the X32. If you prefer the versatility of the X32, Behringer produces a similar mixer designed for touring. The Behringer X32-TP digital mixer touring package is a durable choice. It has many of the same features of the X32, including a total of 40 inputs and 25 buses along with a metal case for storing and transporting the mixer without risk of damage. The Midas M32R is also a close competitor to the X32. It also features 40 inputs and the same 16 Midas-designed microphone preamps. However, it is about twice the price of the X32. The Behringer X32 packs a lot of useful features into a compact three-rack-space digital mixer. You get 40 input channels and Midas-designed mic preamps. You also have the option of controlling the mixer via a smartphone or tablet app instead of connecting to a computer. Most people love the sound quality of the device. There is little noise or latency, delivering superior sound quality over mixers in the same price range. The only drawbacks include the durability of the housing. This rack-mountable mixer cannot take a beating and keep on playing. The X32 is affordable when you consider the sound performance and versatility of this mixer. For mid-range digital mixers, the Behringer X32 is at the top of the list. Is it time to retire that old analog mixer in your church? Here are 4 options to consider when getting the best digital mixer for your church.